BMW launched its 2-Series Active Tourer in Europe in 2014 aimed to compete with the Mercedes market. This highly spacious BMW 2-Series Active Tourer 2015 offers its buyers a good range to choose out of the available three powertrains. Soon after releasing this seven-seat model, BMW gave the glimpse of its intention to expand the lineup by introducing a plug-in hybrid model. 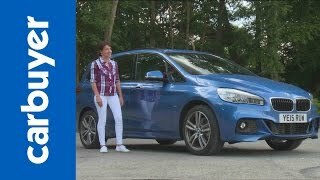 Let us have a closer look of BMW 2 Series Active Tourer 2015, so as to understand the reason behind BMW’s big expectations. Interior of BMW 2 Series Active Tourer 2015 is highly spacious from inside, with the first two seats (Driver and passenger) mounted little higher, offering perfect view of front as well as better space to enter and exit for passengers sitting behind. Apart from this another feature which portrays cleverness of designing team is, high storage facility and passenger seat back rest that comes with option of fold-flat. As an option customers can go for large panoramic roof, that will allow proper flow of light inside. 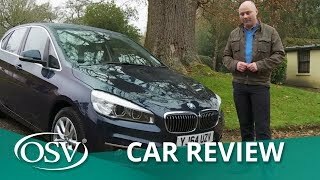 BMW 2 Series Active Tourer 2015 also houses enhanced safety and entertainment features inside packed inside BMW ConnectDrive. Few of them are Traffic Jam Assistant, Camera-based Cruise Control System with stop and go function. A head-Up display is also mounted that features all the vital information for the driver. 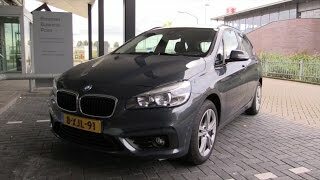 Exterior of BMW 2 Series Active Tourer 2015 portray a forward slanting attractive body. Starting with the front fascia, BMW Kidney grille sits beautifully amidst the twin round-shaped headlights. 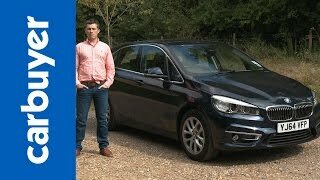 We noticed something you usually don’t in a front wheel drive model and that’s a short overhang at front end of BMW 2 Series Active Tourer. Moving towards the rear end we noticed same short overhang adding to the classic touch of BMW. 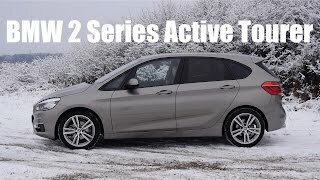 While long wheel base with Hofmeister kink in the rear side windows and the L-shaped gorgeously designed taillights, gives a crispy and attractive look to the entire BMW 2 Series Active Tourer 2015. The BMW 218i Active Tourer 2015 gets its power through a 1.5 liter three-cylinder engine delivering total output of 136 hp and peak torque of 220 nm. The one with highest power beneath is BMW 225i Active Tourer 2015 getting its power through a 2.0 Liter Four-Cylinder engine delivering total output of 231 hp and peak torque of 350 nm. The model takes 6.8 seconds to reach 62mph from standstill while the top speed will be 146 mph. Last one in the list sits middle in performance and power delivery segment. The BMW 218d Active Tourer will be getting its power through a 2.0 Liter Diesel unit delivering total output of 150 hp and peak torque of 330 nm. The 62 mph from standstill sprint will take 8.9 seconds while the top speed stands at 127 mph.